Workers’ compensation is designed to allow employees who are injured while at work, or who have developed a work-related medical condition or disease, to be compensated without needing to prove their employer was negligent. In turn, employers may not prevent employees from collecting workers’ compensation benefits by alleging the injuries were due to the employee’s own negligence. The system can be cumbersome with many requirements for both employees and employers as they muddle through the steps of the claims process. The first step requires employees to notify their employer of the injury as soon as possible or after the employee receives a diagnosis of a medical condition or disease. The next step is for employers to notify the Workers’ Compensation Board of the employee’s injury within 10 days of the injury or illness on the C2-F form, which is provided by the Board. What is the C-2F Form? The C-2F Form was implemented in New York state in 2013 for employers when reporting an employee injury or illness. The form, titled “Employer’s First Report of Work-Related Injury/Illness,” must be filed with the Board within 10 days of the injury or illness. If the employer misses the deadline, he or she will be subject to a financial penalty. Filing the form is required for any injury or illness which requires the employee to take time off of work of more than one day beyond the day of the injury, or one that requires medical attention beyond simple and minor first aid. If you neglect to file the form within 10 days of the injury or illness, it is considered a misdemeanor and carries a possible fine of up to $1,000. The Workers’ Compensation Board may also impose a penalty of up to $2,500 after an administrative hearing. The form itself provides that, if the employer’s insurer will be electronically submitting the accident information to the Workers’ Compensation Board, the employer is not required to submit the C-2F form. If employers are unsure whether they are required to submit the form, they need to contact their insurer for more information. The law requires employers or a third party designated by the employer to maintain the file for 18 years and have it accessible for the Board’s review upon request. The failure to maintain the record is punishable in the same manner as the neglect to file the form within 10 days of the injury or illness. The claims process can be complicated. Employers and employees must both follow detailed regulations. One misstep can result in a worker not being able to collect benefits and/or a fine to the employer. 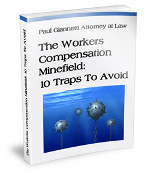 To avoid these pitfalls, contact workers’ compensation lawyer Paul Giannetti for a free consultation.